Need to share HP48 calculator data? 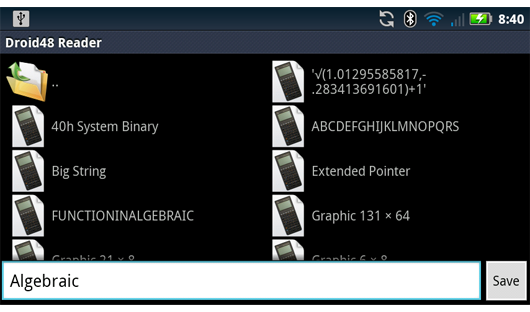 Droid48 Reader lets you share HP48 calculator data from your Android device. Just long-click on what you want to save, select "Save", and you can put the file anywhere on your SD card. Great for making backups or manually posting on WWW sites. 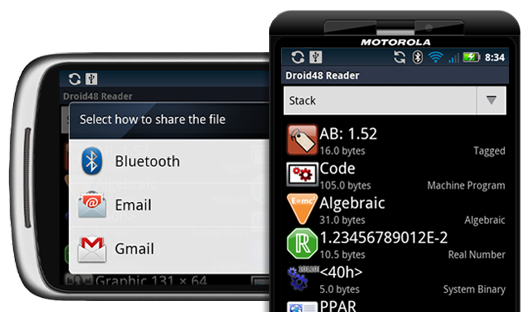 Just long-click on what HP48 data you are interested in while using Droid48 Reader. You can get the information you need at your fingertips. This information includes name, size, CRC, and more. Need to copy the information? Just tap the text and the text is copied to Android's clipboard for you to paste wherever you want. Android 8.0 (Android O) supported via minor UI tweak. Fixed: On Android 7.0 and up (Android Nougat and up), sharing files and images caused a crash. Support for Android 7.0 (Nougat) added. Namely, Android’s new split-screen feature is supported. File UI “Info” can now be copied to the clipboard (just tap on the text). 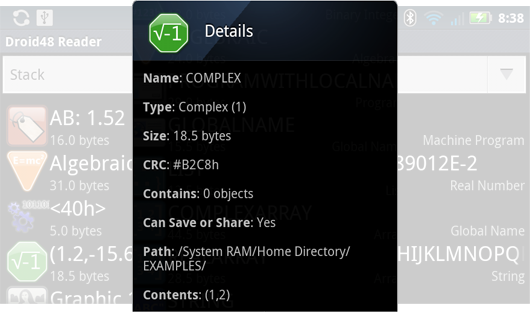 File UI “Info” menu now can display file and path information (ex: you can see the full path of where you are). File UI can jump back to default folder location. Minimum required Android version supported changed to 4.0. Updated for Android 6.0′s changes to accessing the phone’s external storage. Support for DPI size of xxxhdpi. Crash #1 (fixed): was recycling a TypedArray prematurely, exposed on Android 5.0 and later. Crash #2 (fix attempted): some specific phones with Android 4.4+ throw SecurityException that is not documented for Context.getExternalFilesDir().